Stop me if you've heard this before; Sylvester Stallone is set to reprise his iconic role of John Rambo in a fifth movie. ScreenDaily and Deadline have the latest update on the project that has been in the works for years now, reporting that sales on the sequel have been launched at Cannes by Millennium Films. I'm taking this one more seriously with an actual sales push behind it, but it's hard to ignore the multiple times this very same news has been put out there. Stallone is said to be starring and may direct, although the latter isn't confirmed yet. In this film, Rambo has been working on a ranch in Arizona and suffering from PTSD, but when the daughter of a friend is kidnapped he crosses the U.S./Mexico border and faces off against the full might of a violent Mexican cartel. A couple of years ago the word going around was Rambo would be rebooted without Stallone's involvement. The actor had been saying publicly he was done with the character, and this was around the time they were trying to launch a TV series that went nowhere. 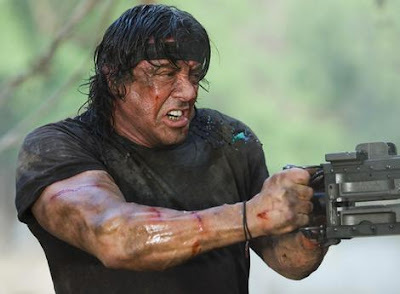 Sly last played the character in 2008's John Rambo which earned $113M worldwide on a $50M budget.